LAKE VIEW TERRACE, Calif.--(BUSINESS WIRE)--Nov. 21, 2018-- KB Home (NYSE: KBH) today announced the grand opening of Sagecrest, its latest collection of new single-family homes in the Los Angeles metro-area. Nestled in the foothills of the San Gabriel Mountains, Sagecrest is convenient to Interstates 5 and 210 and California State Route 118 for easy commuting throughout Los Angeles and Ventura counties. In addition to a planned community garden, residents of Sagecrest can walk to Kagel Canyon Park or explore miles of hiking and equestrian trails through the San Gabriel Mountains. Residents can also enjoy numerous activities at nearby Hansen Dam Recreation Area, which includes a community aquatic center, skate park, golf course, recreation center, equestrian center, and both a recreation and swim lake. Families can explore Discovery Cube® Los Angeles, an educational children’s museum, and history buffs will enjoy the Nethercutt Museum, which features a large selection of rare cars and other antiques. KB Home will host a grand opening celebration at Sagecrest on Saturday, Nov. 24 from 11 a.m. to 2 p.m., during which attendees may tour the elegantly-appointed model home. 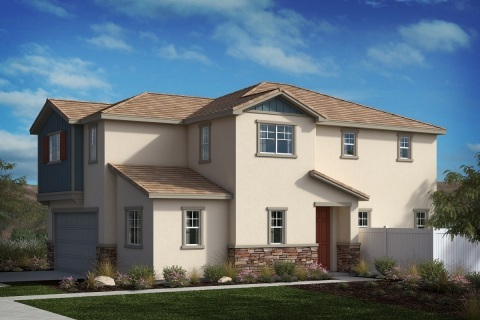 In total, KB Home will be constructing 65 two-story homes and offering four distinct floor plans. With up to five bedrooms and three bathrooms and ranging in size from 1,600 to 2,200 square feet, the homes at Sagecrest also feature such desirable design characteristics as spacious great rooms, ample storage space and elegant master suites. Pricing begins in the low-$600,000s. The KB homes at Sagecrest will be built to current ENERGY STAR® guidelines and include WaterSense® labeled faucets and fixtures, meaning they are designed to be more energy- and water-efficient than most typical new and resale homes available in the area. These energy- and water-saving features are estimated to save homebuyers between $1,188 and $1,512 a year in utility costs, depending on floor plan. As part of KB Home’s distinct homebuilding process, buyers may personalize many aspects of their new home to suit their budget, design style and preferences. After selecting their lot and floorplan, KB homebuyers may work with expert design consultants who guide them through every aspect of the process at the KB Home Design Studio, a retail-like showroom where they may select from a plethora of design and décor choices, including countertops, cabinets, lighting, appliances and window coverings. The Sagecrest sales office is located at 11644 North Amsterdam Ln. in Lake View Terrace. From I-210, exit onto Foothill Blvd. and continue northeast to Osborne St. Make a left on Osborne St. and then left on Osbourne Pl. Make a right onto Eldrich Ave. and the sales office will be on the right. The sales office is open Mondays through Fridays from 10 a.m. to 5 p.m. and on Saturdays and Sundays from 10 a.m. to 6 p.m. For more information about Sagecrest, or KB Home’s other new home neighborhoods, visit www.kbhome.com or call 888-KB-HOMES.